I should just make my own mix. How hard could it be? I’ve been making brownie mixes ever since. I’ve gone through a couple of different recipes but this one is our favorite. This mix makes gooey brownies, because that is the kind we like. I don’t really like brownies plain so I usually jazz them up a bit and make cheese cake brownies or peanut butter swirl brownies. To print a PDF with all of the variations, click the link below the photo at the top of the post. I'll be sharing all the variations this week. Mix all these ingredients together with a whisk and dump them into a Ziploc bag. Remove any excess air from the bag and seal. Be sure to add the cooking instructions to the bag. 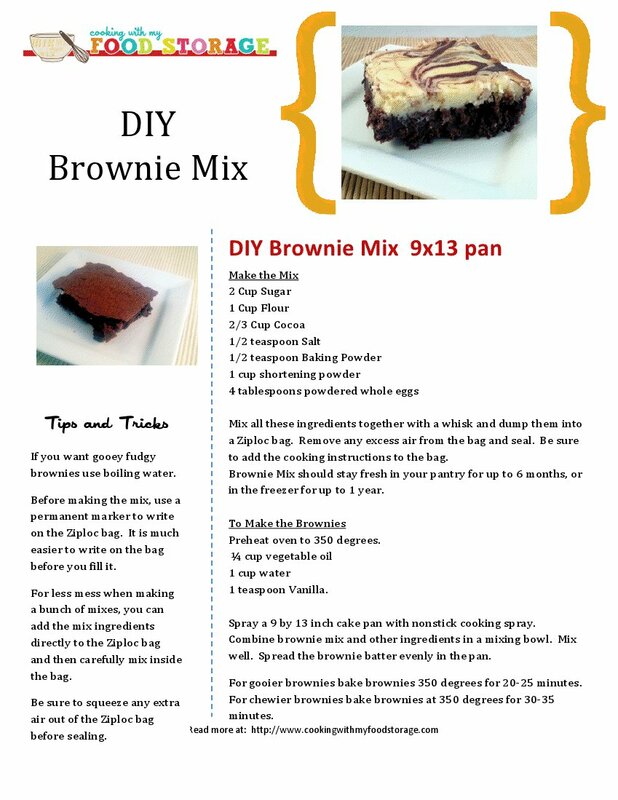 Brownie Mix should stay fresh in your pantry for up to 6 months, or in the freezer for up to 1 year. Spray a 9 by 13 inch cake pan with nonstick cooking spray. Combine brownie mix and other ingredients in a mixing bowl. Mix well. Spread the brownie batter evenly in the pan. For gooier brownies bake brownies 350 degrees for 20-25 minutes. For chewier brownies bake brownies at 350 degrees for 30-35 minutes.